Full duplex radio block diagram. Credit: Full Duplex Radios, White paper, Dinesh Bharadia et al. (Phys.org) —Kumu Networks, co-founded by Stanford professor Sachin Katti, has announced that the company has developed technology that allows for full duplex wireless communications—it lets, the company claims, a radio device transmit and receive signals at the same time on the same frequency, effectively doubling its capacity. Scientists have been struggling with the problem of wasted radio bandwidth for decades. Radios broadcast signals that are much stronger than they receive, which results in a tendency to receive their own broadcast signals, known as self-interference. To get around the problem, device makers build radios that either use two frequencies, or that allow for rapidly taking turns listening and sending. Now it appears, engineers at Kumu have found a better way around the problem and in some respects it resembles the technology used in noise canceling headphones. They have devised a chip that runs proprietary algorithms that listen to the signals that are emitted by a radio. 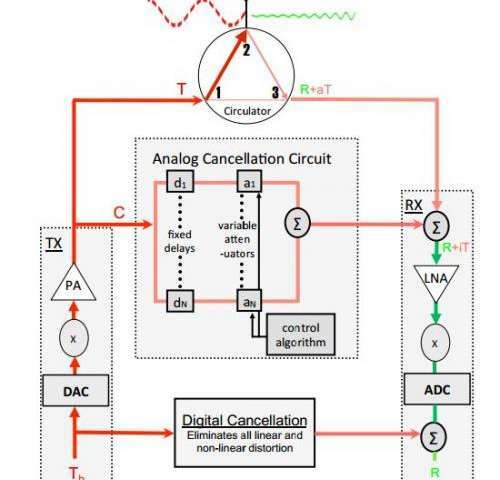 The chip then, using the special algorithms, creates counter signals and broadcasts them which causes the original to be canceled out, allowing for sending and receiving on the same frequency. Kumu reps claim they have built prototype devices based on their chip and report that they are already in talks with unnamed partners to develop, run trials and eventually sell the technology to device makers and wireless carriers. If what the company claims is true, it could mean improved communications for a host of wireless devices, from cell phones, to Wi-Fi networks. It should be noted that not all types of communications would be impacted equally, however—those that are heavily based on one-way traffic, such as downloading a video, would not see much difference. On the other hand, those that operate in both directions, such as cell phone conversations would benefit because the new technology would allow for quicker, easier and simpler handoffs when roaming between carriers. It would also likely help to reduce or eliminate noise in heavily congested areas. There is also the possibility of using it in military applications, allowing for canceling signals from cell phones sent by terrorists to set off remote bombs.